The Common Grackle, (Quiscalus quiscula) a widespread blackbird in the eastern two thirds of North America, has a glossy purple/bronze iridescence and a long tail folded in the shape of a boat keel. The conversion of vast areas of woodlands and prairies to cornfields has resulted in a population explosion of Common Grackles that consume both the grain left behind and the emerging sprouts. Flocks of hundreds or thousands of Common Grackles and smaller numbers of Red-winged Blackbirds and Brown-headed Cowbirds migrate northward across the United States in March, descending on fields during the day and roosting in tall trees at night. The Common Grackle's noisy clucking and harsh "scree" notes seem most unmusical individually, but en masse present an interesting, orchestral sound. The Common Grackle is a year-round resident in the U.S. east of Colorado, except for northern New England and the northern Great lakes. It is a breeding bird in the Rocky Mountains and most of Canada. Common Grackles migrate seasonally within the bird's permanent range. The Boat-tailed Grackle present on the East and Gulf Coasts is larger, with a more exaggerated tail. Female Boat-tailed Grackles are brown. . 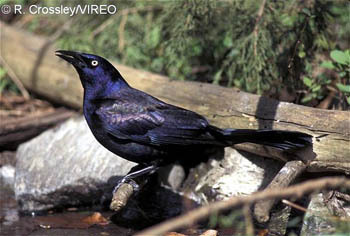 The Great-tailed Grackle present in the south-central and southwestern U.S. and Mexico is exceptionally large (L. 18 in. ), and the female is entirely brown. The Rusty Blackbird is smaller and lacks the keel-and-wedge-shaped tail. The Brewer's Blackbird is smaller and lacks the keel-and-wedge-shaped tail. 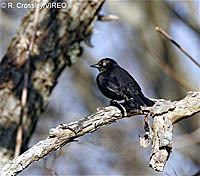 The Brown-headed Cowbird is much smaller, has a brown head and a short bill, and lacks the keel-and-wedge-shaped tail. The Common Grackle prefers conifers for nesting and is semi-colonial. It inhabits a wide variety of habitats from suburban backyards and cities to farm fields and forest edges. The Common Grackle is rapacious; it devours other birds' young and their eggs and even some adult birds, as well as agricultural grains and sprouts, human food, and insects. It rubs its feathers with ants, black walnuts, citrus fruits, and marigolds, apparently to control mites. The Common Grackle is the subject of pest control programs, mostly in residential areas where large concentrations of grackles can present a human health risk from the spread of fungal disease present in the feces.